You cannot help but be mesmerised to the skies during March to September. For many that is simply longing for the sun to break through the cloud but for others it is the chance of seeing the Ospreys pass above as they search from height for their next prey. The BBC series “Highlands: Scotland’s Wild Heart” narrated by Ewan McGregor brought Ospreys to the masses. 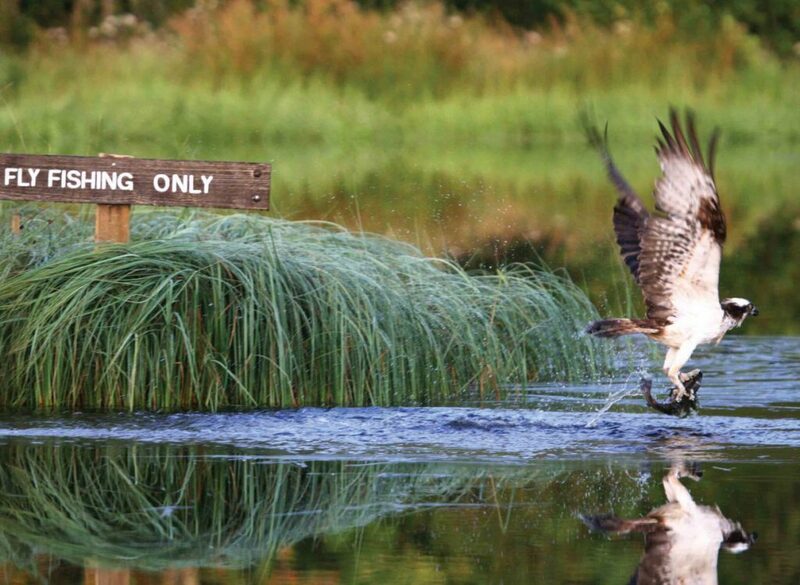 A mind-blowing clip of an osprey with its talons out heading with serious intent into the water in search of its next meal was filmed at our dedicated osprey pond on Rothiemurchus. The clip went viral and has been viewed over 27 million times! The film crew from Maramedia, who were filming for BBC, spent about 5 days trying to capture the footage that ended up on our TV screens at home. Sitting in hides set at low level against the bank of the pond, a camera crew waited patiently for one of our guides to contact them through the radio to tell them there was an osprey overhead looking interested in fishing. Patience is required in this game and a high amount of respect for the birds and their behaviour is needed. It is not as simple as pressing a button and receiving a diving osprey. A lot of time is spent sitting…waiting…waiting and finally the waiting pays off and the fireworks happen, albeit very quickly! In general, those photographing or filming have 3 seconds to capture the footage from the osprey hitting the water to it leaving with a fish (hopefully!). We have had an osprey leave with two fish (one in each talon) and also a rock for one unlucky osprey! Ospreys are a massive part of daily life here for all staff on Rothiemurchus. They feel like part of the furniture so much so that when they head back to Africa there is a part of everyone that feels like a piece of furniture has been taken away from us – temporarily of course! Doing our little bit not only to help the ospreys increase their stronghold here but also assist an increasing number of enthusiastic photographers and watchers to responsibly try and capture an experience of an osprey diving at close quarters is a real pleasure. It has taken years of studying the birds, making alterations to the hides and water (out of season) to get these birds to take fish from a specific location. Using only live fish we have created a fishing location specifically setup only for ospreys (and the occasional otter and heron too! ), free from human disturbance. We ensure that the message is conveyed of how special an experience this is to guests who come from all over the world to see Scottish Ospreys hunt. 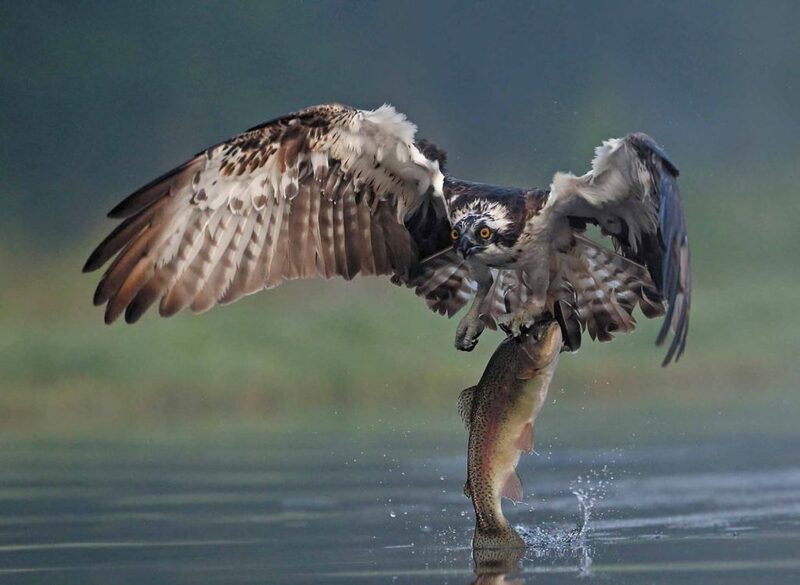 Of course it is never as easy with wildlife to suggest that you will see ospreys fishing during every session but when they do, it is something that will get the heart beating that little bit faster, get your palm of your hands sweaty and after it is all over will certainly never leave your memory. You can experience this for yourself by booking onto one of our early morning guided sessions or coming in during the day for an unguided session. Check out details of our Osprey Photography Sessions here.